Ahh yes I had briefly tried it and it is nice to see that main menu working . I was wondering if you had a chance to try SUVUTU? I haven't had much of a chance to investigate myself. 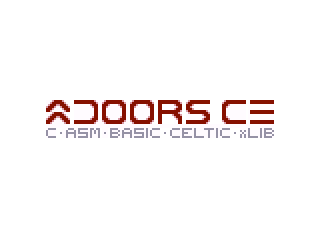 Also I wonder how Doors CE would look as a logo? Wait the beta is out? Where can I sign up? No. Only Kerm and tr1p1ea have already DoorsCE, for creating the program actually. When it is in a stable state, Kerm will make it closed-beta for specific bug-testers, and once that is ready, it will be open-beta, and then can everyone use it. Great Work, Kerm! I can't wait for its release! Thank you (and more like "great work, tr1p1pea!" ). Although it continues to crawl along, we'll do our best to find time to finish off the remaining features and bug-fixes when we can. Debug crash on 2:Goto Found and fixed. Debug crashes/freezes with folder restoration. Repaired. Resolve problems with implementing poweroff to ensure that OS will not crash after quitting DCE after poweroff/APD. Ensure that memory leak when DCE ran itself via HomeRun is resolved. Make hook chainer work properly, at least with GetKeyHook and AppChangeHook. Make shell functions called via ExecArcHook put their cleanup routines in safeRAM instead of assuming the layout of Archive hasn't changed. Done for AppChangeHook, not yet for ParserHook. Make editing both archived and Unarchived programs from the home screen work. Sorted and tested, other than implementing the previous item. Debug crash when loading new DCE version over old on emulator. -> Probably caused by HomeRun pointing to the wrong place because the stub is not loaded. Yep, caused by stub not holding proper contents. Need to detect this and let the OS handle running the program instead. Possibly (untested) fixed. Relies on following item. HomeRun ParserHook uses absolute calls to ParserHookChkPrgm, getHomescreenToken, and getHomescreenByte. This makes it crash it many circumstances. Create small core ASM library for DCE programs? This is awesome! Paging through this thread, I'm surprised how far this has come already! I'm impatient, though , so what with all I'm seeing here (like that awesome screenie of a Zelda-like game...is that the speed it actually would run on a CE? ), I'm going to expect a good amount of progress. Hopefully you can get it done as soon as possible! Oh, and one thing: I haven't seen how you'll resolve any conflict with Cesium's prgmA launcher. Are we going to be able to use both shells simultaneously, or must only one be used at a time? Honestly, I don't see why you would need Cesium once DCE9 comes out. One problem I have with all the Doors series, is that it takes forever to archive, lock, and hide programs. With Cesium, it gets into a routine, with you just repeatedly pressing alpha and 2nd. With Doors CE, this will be much harder. An option that would do it all at once would be a great solution to this problem. I'm not sure how hard it would be to implement this though. May i assume that the DCE folder system will be identical to that of earlier versions? The code inside the shell that handles folders is not identical, but it does follow the same folder naming, numbering, and tagging conventions as in previous versions. I see very much of progress. But one question, will there be a mouse in the DCE? I think there will be, but by seeing last GIFs on this topic I don't see any mouse there, so I'm just curious. Also, if start of development is 0% and open-beta is 100%, where are we now, at what percent? What about closed-beta? There hasnt been a mouse in doors since DCS7, but it isn't really needed. Shortcut keys and arrow keys make a mouse slow and clumsy by comparison. Can't wait for this to come out. It would help me so much. Great work Kerm. Although I'd love to have interoperability, at least for the first version I won't be focusing on it. I'd imagine that Cesium and Doors CE will duel over whose prgmA is available for now. Without the mouse, it's a lot easier: ALPHA, down (down, down), 2nd/ENTER, repeat. I do like the idea of being able to select a group of programs and then perform the same operation on all of them, but that's a future feature, if anything. I miss the mouse too, but the lack of mouse ends up just being more practical on calculators. I wish it wasn't so. Something like 95%. A complete lack of free time on my part has kept the shell very close but not quite at the closed beta stage. Don't forget tr1p1ea! Thank you. Hmm, given how much we can already do with Mateo's C libraries, imagine putting DoorsCS on top of that... The sky's the limit! The 68ks had C but were limited due to their small monochrome LCDs, the Nspires had color were limited due to Lua, and now we have the best of both worlds, color and C support. Although I'd love to have interoperability, at least for the first version I won't be focusing on it. On the 84+CSE, DCSE was the only relevant shell, so it could impose its own way of doing things. However, on the TI-eZ80 series, DCE is a slow, late mover, over half a year after the others, who laid up good, open-source ground work. I'm just trying to raise the point that prgmA wars on the monochrome TI-Z80 series weren't great from the POV of actual end user usage, for the short, mid and long term. Yes, I've used (or seen others use, at school) 83+-era monochrome TI-Z80 series calculators enough. So if authors of TI-eZ80 so-called "shells" can, they would probably best avoid them, for users' sake. If its components are suitably modular and interoperable, yeah. Otherwise, the promise couldn't be fulfilled as much. © Copyright 2000-2019 Cemetech & Christopher Mitchell :: Page Execution Time: 0.303366 seconds.